FOXBORO, Mass. 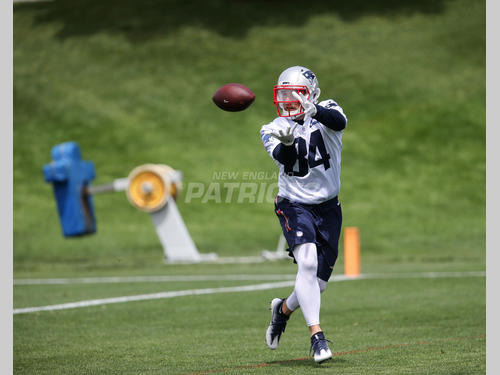 — The Patriots defense played the spoiler role on Wednesday during the second day of minicamp. Between the secondary and defensive line, 10 passes were batted down during practice. There was, however, one player the defense couldn’t stop — Rex Burkhead. The 26-year-old running back caught six passes to lead all targets. Burkhead received a heavy load with the Patriots starting offense and it paid dividends. Burkhead, the former Cincinnati Bengals running back who signed a one-year, $3.15-million deal in the offseason, only has one career start but he hasn’t missed a game the last two seasons. He is coming off a year in which he averaged 4.6 yards a carry and made 17 receptions, both career highs. How the 5-foot-10, 210-pound Burkhead will be utilized in New England remains to be seen. Considering the players aren’t in pads and contact isn’t allowed, it’s best not to make too much out of what occurs on the field during organized team activities. Tom Brady started the day going 11-for-14 in 7-on-7s. When it came time for 11-on-11 drills, Burkhead’s presence immediately stood out. Brady went 13-for-18 in full-team drills. Five of those receptions went to Burkhead.